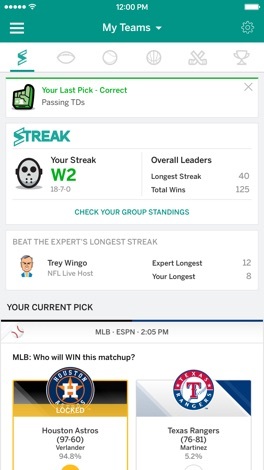 ESPN Fantasy Football is back for another season in the #1 fantasy sports app, alongside fantasy basketball, hockey, baseball, and our uber-fun prediction game, Streak. All ESPN games are completely free to play. 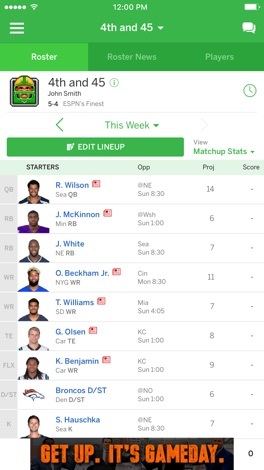 -Create a fantasy football, basketball, baseball, or hockey league to play with friends or join an existing league to compete against other fans. You can play our standard game or customize the rules to your liking. -Sign up, draft your fantasy team, edit your lineup, add players, and make trades. -Get player rankings, projections, and analysis from the most trusted names in fantasy sports, including Matthew Berry. -Follow your players all season long with live, real-time matchup and pro game scoring. -Predict the winners for biggest matchups in sports each day in Streak for a chance to win cash prizes and bragging rights. Test your sports knowledge against ESPN experts, friends, family, and other fans. -Customize your teams with hundreds of exclusive, free team logos. From ESPN personalities to your favorite superhero, there’s something for everyone. -Subscribe to alerts and get the latest videos and news for the players on your roster, right as news breaks. 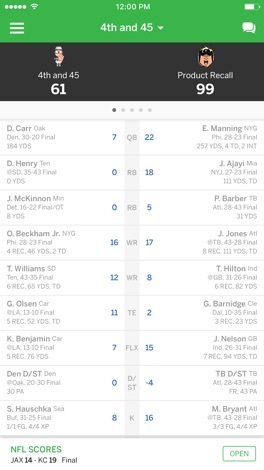 -Subscribe to weekly wrap-up emails to track your fantasy performance all season long.